Culms: Erect, stout, triangular, light-green, rough above, bases purplish red. Leaves: Elongate, firm, some overtopping inflorescence, to 1/3 inch wide, green, rough. 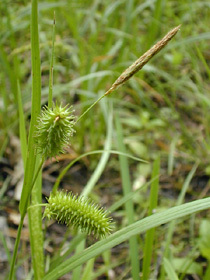 Inflorescences: Spikes, unisexual; terminal spike staminate, 1/2 to 2 inches long, less than 1/6 inch thick, slender-stalked, often with leaf-like bract at base; staminate scales reddish brown with green centers, awned; lateral spikes 1-4, pistillate, densely flowered, oblong-cylindric, .75 to 2.5 inches long, to 3/5 inch thick, subtended by leaf-like bracts; upper pistillate spikes nearly sessile; lower pistillate spikes slender-stalked, somewhat drooping; pistillate scales usually shorter than perigynium, inconspicuous, reddish brown with green centers; awns long, minutely toothed; perigynia to 100 per spike, elongate egg-shaped, pale green, shiny, many-ribbed, tapered abruptly into long beaks with 2 rigid teeth. Fruits: Achenes, triangular, brown, 1-seeded; stigmas 3, reddish brown. Habitat: Open wet sites, marshy areas, swamps, shorelines, and ditches. Distribution: Principally north two thirds of Kansas. Comments: Carex comes from the Greek word keirein, "to cut", which probably alludes to the rough-margined leaves of members of the genus.